Home > Around Town > Best Places to Ice Skate Around Dayton Your guide to all the local rinks! What can you and your family do to stay fit while having a blast? Ice skating, of course! It’s time to kick off your shoes, lace up those skates and hit the ice! Gather your family together and check out these locations where fun and exercise go hand-in-hand. We’ve found lots of options included in our Best Places to Ice Skate Around Dayton and a few in Cincinnati that offer family-friendly times and skate rentals. Don’t be afraid if you have never ice skated before, some rinks even offer instruction. South Metro Sports offers public ice skating throughout the calendar year, please check the schedule for days and times. Admission for children (under 18) is $7 and adults are $8. Figure or hockey skate rental is $2. Prior to skating first session waivers must be filled out and will be kept on file. 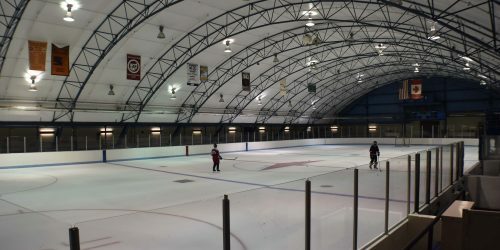 Hobart Arena offers public and family ice skating hours throughout the calendar year, please check the schedule for days and times. They offer groups rates for 20 or more. Family Skate Sessions: families with one paying parent will be admitted for half the admission price. Adults $6.00, Youth (14 & under) $5.00, Senior (60+) $4.00, Skate Rental $2.50. Located at 255 Adams Street, Troy. Now that you have the best places to skate, do you have your skating essentials? If your child is a beginner, they may want to wear snow pants – so their clothes don’t get wet when they fall. Helmets are also a great way to keep your little ones safe. And waterproof gloves and a hat are a must! Have fun and make this winter the best ever!